Kalama® VITROFLEX® A99 by Emerald Performance Materials is a benzoate plasticizer designed for A-side of 2K polysulphide sealants. Provides low odor and low impurity. Exhibits excellent processing characteristics, pot life, mechanical properties and adhesion. Offers exceptional permanence, low migration and low fogging. It has excellent compatibility with polysulphide polymers. 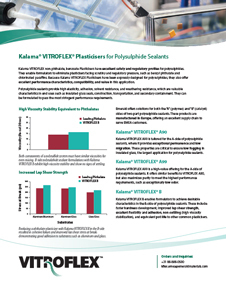 Kalama® VITROFLEX® A99 complies with FDA 21 CFR 175.105 regulation. Please note, these HSP values are estimations. It is based upon the “like seeks like” principle. It splits an ingredients interactions into three parameters; δD (Dispersion force interactions), δP (Polar forces interactions) and δH (Hydrogen bond force interactions). Hansen Solubility Parameters can help you find a wide range of products that are predicted to be compatible with Kalama® VITROFLEX® A99. A practical determination of these HSP values would provide higher certainty. Learn More.